The Tech Works MJ-1 Microphone Jack is a complete assembly for easy installation without the need for a soldering iron. 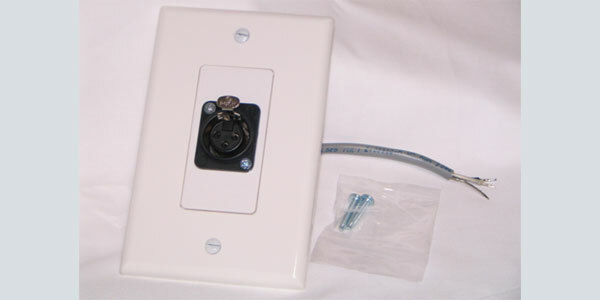 A 3 pin XLR style connector is provided on a white plastic Deco electrical plate. The XLR connector is pre-wired to a 6-inch length of twisted pair, shielded cable with stripped and tinned ends. All the installer needs is a professional crimp tool to attach the MJ-1 to the field cable. A standard 1-Gang Nylon trim plate is included. Wiring is a standard twisted, shielded audio pair cable for connection by spice caps. This product is specifically designed and manufactured for use with the IC-52 Intercom Amplifier.